Resettable inline circuit breaker with manual reset button for use with higher amperage accessories. Complies with Standard SAE J553 and SAE J1171 (Ignition Protected). Splash proof. 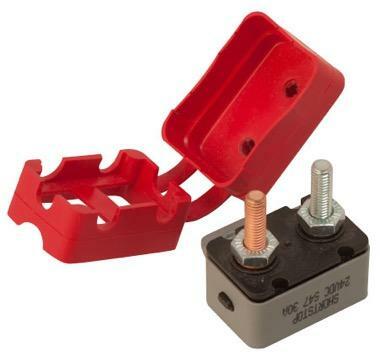 May be used on 12 volt or 24 volt systems. All breakers have #10-32 studs, complete with nuts. The copper post is the battery or power in post and the silver post is the Aux. or power out, protected post.